The Auburn Doubledays, short season single A affiliate of the Washington Nationals, are pleased to announce the release of their schedule for the 2018 season. The Doubledays are celebrating their 60th year in the NYPL this year. The Doubledays have seen 29 players reach the major leagues in the last 7 years of affiliation with the Nationals including all-star Anthony Rendon, Wilmer Difo, and Andrew Stevenson from this years Nationals roster. 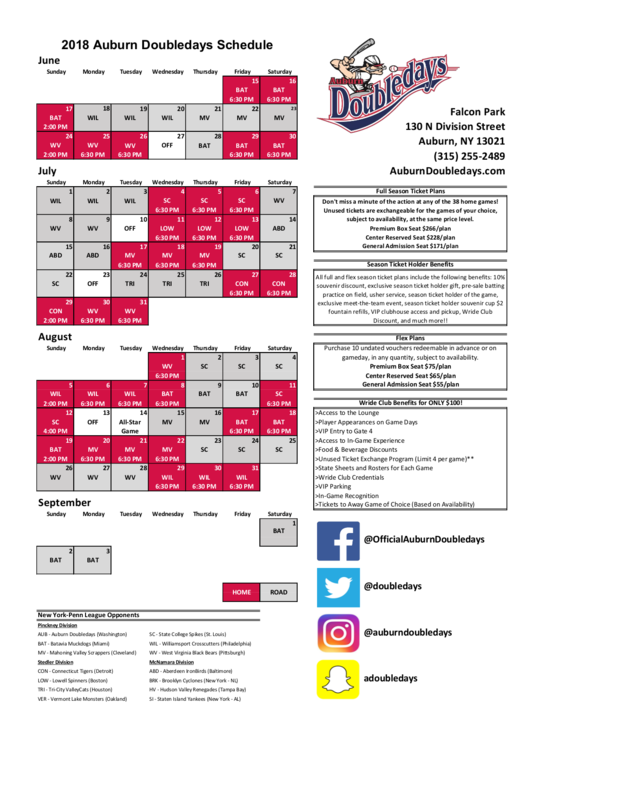 The Doubledays will open their season with a three game rivalry series against the Batavia Muckdogs at home June 15-17, and the last home game of the season will be on September 3rd at the Batavia Muckdogs. The regular season home finale will be August 31 for the last of a three game series against the Williamsport Crosscutters. Weekday and Saturday games will start at 6:30 PM, a new time this year, and Sundays will continue to be 2 PM. The only exception will be Sunday, August 12th, which will start at 4 PM. The schedule consists of 4 games on Mondays and Thursdays, 5 games on Tuesdays and Saturdays, 7 games on Wednesdays and Fridays, and 6 Sunday games. The Doubledays will be revealing their community initiative and support campaigns for each day very soon, and will continue to support their community during the season. "We couldn't be more excited about this 2018 season, and we look forward to greater support from our community." said Adam Winslow. "By moving up the start time, we feel this will be more suitable for all of our fans, especially our families with young children in the surrounding communities." For the 2018 Doubledays Season click here.